Well I got my new Shea butter in! YAY! It’s great! It is much more smooth and light. It is not oily/greasy like the RA cosmetics brand. This Shea butter was ordered from eBay from cocoabutterstore. I got 2 lbs. of Shea butter for $19.50 (free shipping…well probably shipping included). And I also purchased 1 lb of mango butter for $14. Which is pretty good since it goes a long way. The blocks of butters came in saran wrap and in a plastic baggie. At first I thought…wow! But it works fine, I did not have to take it out and put it in another container. These butters are much better quality! And I really think that these are not refined, unlike the ones that are sold in retail and health food stores. So I am convinced and pleased! I love Shea Butter, and recently I have been doing some research on the benefits if this widespread and vouched-for product. I have read some articles and visited some websites that talk about refined vs. unrefined Shea Butters. I know that most plant-based products that have been processed with harsh chemicals or high heat usually lose most of their beneficial traits. Just as coking raw vegetables, “cooks-away” most of the nutrients. So this makes sense. But I had to see for myself. 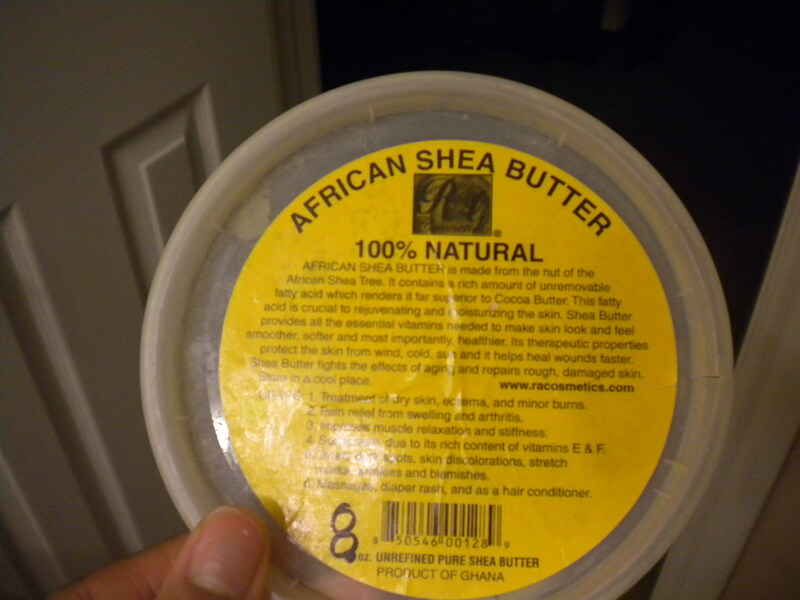 So I tried to think back to the first time that I purchased some Shea Butter. 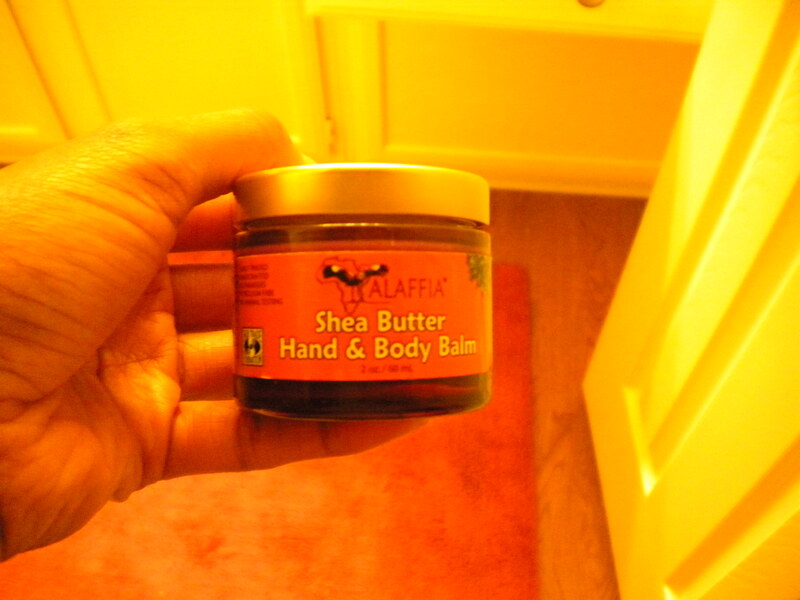 The first butter I got was the Alaffia Shea Butter Hand and Body Balm. Let me first say that I have eczema, and my outbreaks only occur during the January-February months of the South. So this is when I am frantically searching for the best products for my dry, painful skin. I remember this Body Balm working pretty well, but I needed to apply the butter at least 3-4 times a day only because my skin was so dry, and I was out in the elements a lot, walking to class and what-not, not because the stuff did not work. I knew that I could not afford to buy this product, which cost at least $10 for about 2 oz. So I searched for a cheaper alternative. I found Shea Butter in the local Beauty Supply Store (ran by Korean-Americans). About $4.99 for 8 oz and $8.99 for 16 oz. Had to try it! So I did, and I have been using this RA Cosmetics Shea Butter, which says it is unrefined, for the last few years. 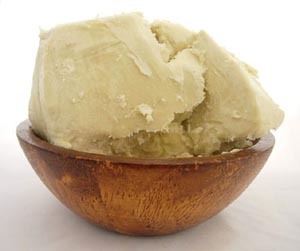 I did more research (that is what scientists do), and I found a web article that stated that most Shea Butters that re sold in retail or are found as ingredients in other lotions, are refined. So I was curious. Was I using refined Shea Butter? The article also said spelled out the benefits of unrefined vs. refined, and basically, it is like romaine lettuce vs. iceberg lettuce. Full of nutrients vs. no nutrients. I had to see the difference for myself. I ordered some raw, white, unrefined Shea butter off of Ebay, which should be coming in the mail soon. So, I will let you know how, if at all, this is different from the kind that I had been using. Poll: If You Had to Choose. Shea Butter or Coconut Oil? Poll: If You Had to Choose. Shea Butter or Coconut Oil?.